With a foreword by David Halberstam. He spoke out against player trading. He banned Pete Rose from baseball for gambling. He even asked sports fans to clean up their acts. Bart Giamatti was baseball's Renaissance man and its commissioner. 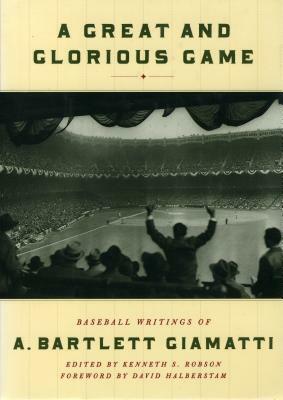 In A GREAT AND GLORIOUS GAME, a collection of spirited, incisive essays, Giamatti reflects on the meaning of the game. Baseball, for him, was a metaphor for life. He artfully argues that baseball is much more than an American "pastime." "Baseball is about going home," he wrote, "and how hard it is to get there and how driven is our need." And in his powerful 1989 decision to ban Pete Rose from baseball, Giamatti states that no individual is superior to the game itself, just as no individual is superior to our democracy. A GREAT AND GLORIOUS GAME is a thoughtful meditation on baseball, character, and values by one of the most eloquent men in the world of sport. Kenneth S. Robson, M.D., is a professor of psychiatry at the University of Connecticut, a clinical professor at Yale University, his alma mater, and a practicing child and adolescent psychiatrist.